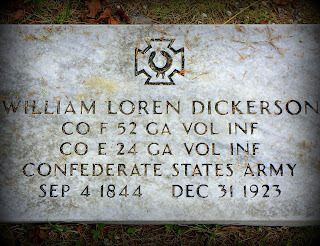 In 1863, as a private in Company F of Georgia's 52nd regiment. What landed him on Pea Patch Island was the fighting he did at The Battle of Champion Hill on the 16th of May, down in Mississippi. 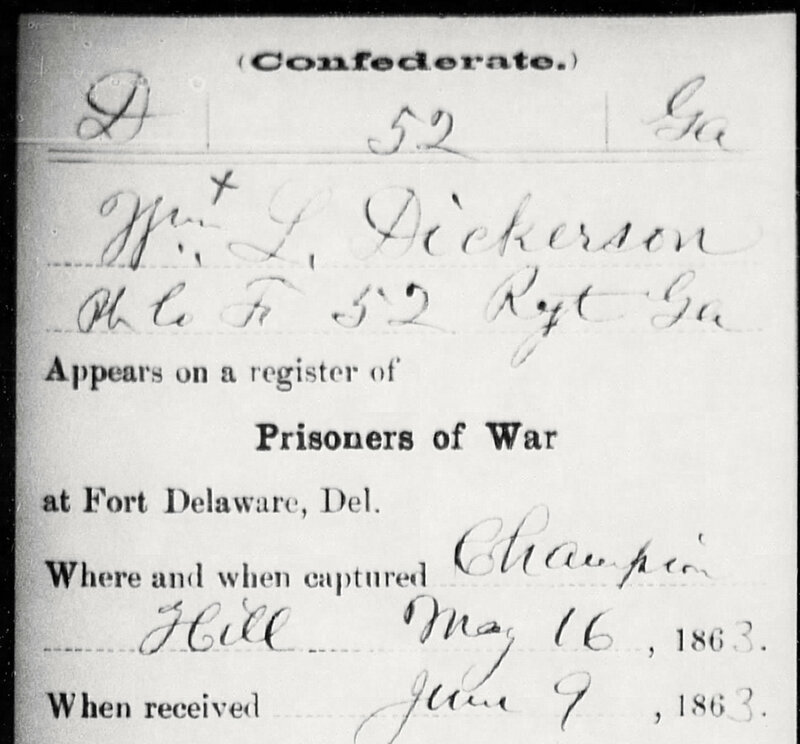 William Loren Dickerson was captured by the Union Army during that battle, and a few weeks later arrived at Fort Delaware. According to an article at Wikipedia, citing the Philadelphia Inquirer, Fort Delaware "contained an average population of southern tourists, who came at the urgent invitation of Mr. Lincoln." At the time of Pvt. Dickerson's imprisonment, the camp population was about 11,000. By the end of the war, the number had jumped to 33,000. Though the conditions were classified as decent, one private described them as "bad, hopeless and gloomy enough without any exaggeration." 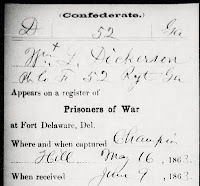 I suppose I can say W. L. Dickerson was "lucky" enough to spend less than a month at the prison camp before being exchanged on 4 July 1863. What a nice way to celebrate Independence Day. The next year, Pvt. Dickerson was transferred to Company E of Georgia's 24th Infantry Regiment. 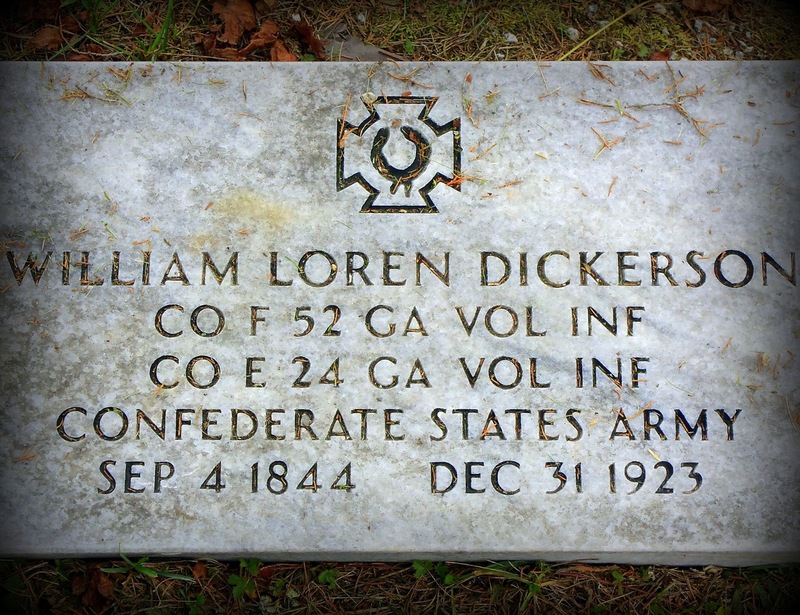 According to his Civil War Soldier Profile at Ancestry, William Loring Dickerson survived the war and was mustered out 9 April 1865 at Appomattox Court House, Virginia. W. L. Dickerson was just 17 years old when he signed up to fight in 1862. After the war, his time was spent farming in Rabun County, Georgia. Online family trees and census records suggest William married a lady named Hindy and had several children. 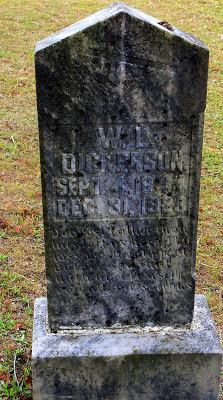 W. L. Dickerson died on New Year's Eve, 1923. He was laid to rest at the graveyard of Blue Heights Baptist Church in Mountain City, Rabun County, Georgia. Thy loss we deeply feel.